Of Course Leadership Development is Important! Numerous studies confirm the importance of leadership development and the positive impact effective leaders have on the performance of companies. INSEAD global business school (Vries & Korotove, 2010) states “Organizations that take leadership development seriously outperform the competition.” David Day from Pennsylvania State University conclude “Many organizations are viewing leadership as a source of competitive advantage and are investing in its development accordingly” (Day, 2001). And of course, every company that provides or supports leadership development services has an abundance of research to validate the importance of developing our leaders. Developing leaders is critical as Arizona focuses on advancing its standing in the technology and business community nationwide. The Arizona Technology Council and ImpaQ Solutions recently conducted a survey among leaders from Arizona technology related companies asking for their opinions as we craft a leadership development program. 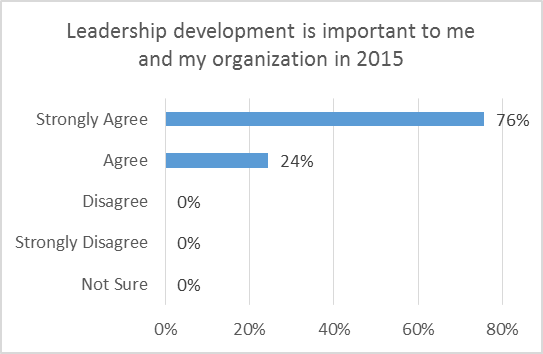 Response to the question: “Leadership development is important to me and my organization in 2015” confirmed research across the world with 100% of respondents stating they strongly agree (76%) or agree (24%). Unfortunately, the remaining survey results did not support the statement of leadership development being important to organizations. When asked if the respondent had personally participated in leadership development activities over the past two years, less than half (49%) responded that they had. How, if leadership development was so important to so many, have only half of people participated in any leadership development activities? Questions and possibilities abounded. Below are three possibilities that quickly come to mind. They didn’t know what development opportunities were available. Let’s explore each of these possibilities. Did they think they didn’t have time? My computer died recently. Not because it wasn’t a “good” computer – I had done extensive research before buying the computer and felt confident I had bought the right one. It has worked (almost) perfectly every day since I had bought it in 2003. And the fact that I couldn’t find updated software to run on my Windows 2000 machine wasn’t important – what I had worked just fine. Why did it die? Because there were always other higher priorities; I just didn’t have time. “Our employees are our most valuable asset” is a standard cliché that is repeated over and over by companies and organizations of all description. The HR Scorecard published by Harvard Business Press (E., Huselid, & Ulrich, 2001) demonstrates that higher employee engagement scores tend to be statistically correlated with increased corporate performance. If the leaders of the companies – who state leadership development is important — do not demonstrate that investing in leadership development is worth the time, what message is permeated throughout the organization? We make time to keep our computers updated. We make time to keep our marketing updated. We make time to keep our technology updated. Yet too often we do not make time – require the time – to keep our leaders updated. Saying we don’t have time is just another way of saying that it isn’t important enough. Did they think they didn’t need it? I often hear (and naively have said it myself in the past), “I don’t need the training or development but my team does.” This line of thinking supports the old saying “we often don’t know what we don’t know.” Continuous learning and growth are keys to… well, continued learning and growth. Once we think we know “enough” we become stuck in our current place. This conclusion is true whether you are the CEO of a Fortune 100 company or a budding entrepreneur with only a dream. 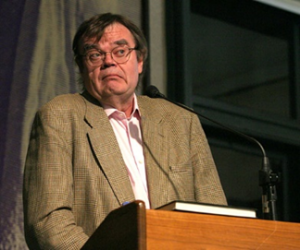 Research shows that it is human tendency to think of ourselves as “better than average.” The technically accurate term is illusory superiority; a more pleasant sounding name for it is the Lake Wobegon effect. The Lake Wobegon effect is named for the fictional town of Lake Wobegon from the radio series A Prairie Home Companion, where, according to Garrison Keillor, “all the women are strong, all the men are good looking, and all the children are above average.” According to the Journal of Personal and Social Psychology (Guenther & Alick, 2010), the tendency for people to evaluate themselves more favorably than an average-peer, the better-than-average effect (BTAE), is among the most well-documented effects in the social-psychological literature. Experiments and surveys have repeatedly shown that most people believe that they possess attributes that are better or more desirable than average. One poll found that 90 percent of leaders believe that they are in the top 10 percent of performers. But just because “everyone is doing it” doesn’t mean that you should do it – nor will it help create a competitive edge. Did they not know what was available? Perhaps the half who did not participate in activities to continue developing themselves just did not know what was available. Perhaps the market is not providing the leadership development opportunities that the leaders need. Employees often become senior leaders in companies because of their years of experience and knowledge of business and management. In fact, many of those surveyed indicated that they taught management and leadership courses. There is a plethora of management training opportunities and courses that focus on management skills such as sales skills, marketing skills, supervisory skills, and analytical skills. And there are some good academic courses available at our local universities. But for those who have completed their formal education and are experienced in managing, there is limited available. Many managers and leaders have learned how to be an effective managerial leader, what James MacGregor Burns, Pulitzer Prize-wining historian, describes as “transactional leadership.” Burns describes transactional leadership as focusing on the role of supervision, organization, and group performance; a style of leadership in which the leader promotes compliance of his/her followers through both rewards and punishments. Once leaders become expert at managing, they may think there is nothing left to learn. Transactional leadership is sufficient to keep you and your company operating effectively. It is very good at maintaining the status quo. Transactional leadership is not sufficient to move you and your company to higher levels. Burns’ 1978 book, Leadership, introduced the theory of “transformational leadership” and differentiated between transactional leadership. Transformational leadership is a style of leadership where the leader is charged with identifying the needed change, creating a vision to guide the change through inspiration, and executing the change in tandem with committed members of the group. Transformational leadership transforms you and your company to higher levels. 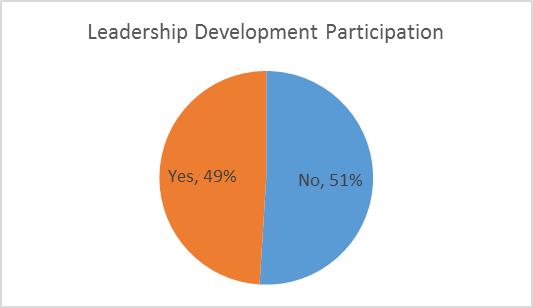 Perhaps respondents did not participate in leadership development because they could not find the opportunities that appealed to help them move to the next level. Every executive needs to ask himself or herself what they are willing to invest personally to move their company to a higher level of success. What do you think? Please share your thoughts on why so few people participate in something that so many believe is important. Previous post: Are You Good Enough? Compared to Whom? Get our thought-provoking SuccessTips delivered straight to your inbox for free!